"Garlic, onions, and leeks may be lacking in color, but they're bursting with powerful phytochemicals, substances found only in plants that help your body fight disease and promote good health," according to the Centers for Disease Control and Prevention. Vegetables from the onion family, which includes garlic, chives, scallions, leeks share a group of phytochemicals that are very important to good health, with allicin the most common phytochemical. Allicin may play a role in helping lower cholesterol and blood pressure and increasing the body's ability to fight infections. If cooking with onions brings tears to your eyes, here's why: "The tearjerker in onions is a compound called propanethial-s-oxide, which is released in a vapor when onions are cut" according to Cheryl Forberg, professional chef, and registered dietitian. "When the vapor comes in contact with the eye, it is converted to a form of sulfuric acid, which produces the stinging sensation and subsequent tears. Cutting onions under water or chilling them before cutting, will retard the enzymes that generate the noxious chemicals," recommends Forberg. To reduce tearing when cutting an onion, the National Onion Association recommends you "... first chill the onions for 30 minutes. Then, cut off the top and peel the outer layers leaving the root end intact." It's the root end that has the highest concentration of the sulphuric compounds that cause your eyes to tear. If you still have problems with tearing, consider purchasing pre-chopped onions. 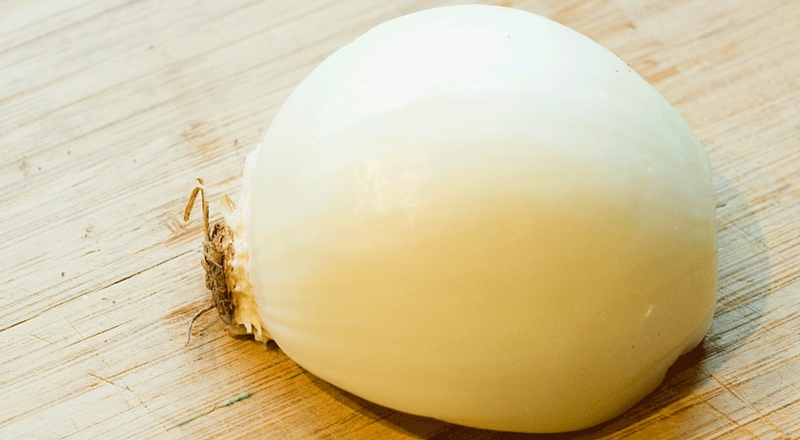 If a sweet onion will work in your recipe, sweet onions may be less likely to make you cry.